This paper describes research undertaken to establish plausible fuel-speed curves (FSC) for hypothetical advanced power train vehicles. These FSC are needed to account for the effects of congestion in long-term transportation scenario analysis considering fuel consumption and emissions. We use the PERE fuel consumption model with real-world driving schedules and a range of vehicle characteristics to estimate fuel economy (FE) in varying traffic conditions for light-duty internal combustion engine (ICE) vehicles, hybrid gas-electric vehicles (HEV), fully electric vehicles (EV), and fuel cell vehicles (FCV). FSC are fit to model results for each of 145 hypothetical vehicles. Analysis of the FSC shows that advanced powertrain vehicles are expected to perform proportionally better in congestion than ICE vehicles (when compared to their performance in free-flow conditions). HEV are less sensitive to average speed than ICE vehicles, and tend to maintain their free-flow FE down to 20 mph. FE increases for EV and FCV from free-flow conditions down to about 20-30 mph. Beyond powertrain type differences, relative FE in congestion is expected to improve for vehicles with less weight, smaller engines, higher hybrid thresholds, and lower accessory loads (such as air conditioning usage). Relative FE in congestion also improves for vehicle characteristics that disproportionately reduce efficiency at higher speeds, such as higher aerodynamic drag and rolling resistance. In order to implement these FSC for scenario analysis, we propose a bounded approach based on a qualitative characterization of the future vehicle fleet. The results presented in this paper will assist analysis of the roles that vehicle technology and congestion mitigation can play in reducing fuel consumption and emissions from roadway travel. 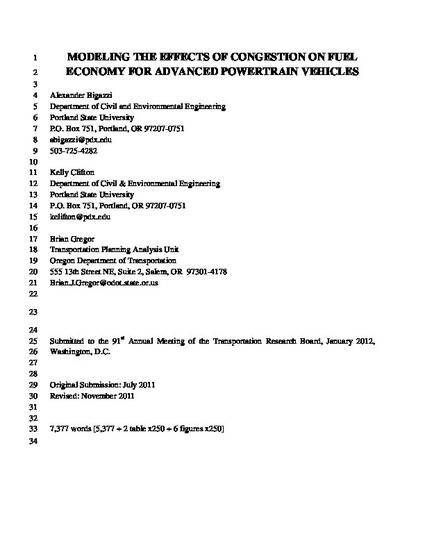 Submitted to the 91st 25 Annual Meeting of the Transportation Research Board, January 2012, 26 Washington, D.C.